This week's London on the Cheap is sponsored by The dailychic. Friday: Take a Bat Walk in Dulwich Park which is "home to a number of species of bat, including two types of pipistrelle and the noctule". Starts 8.45pm. Tickets £3/2. Booking essential! Saturday: It's the first weekend of the Dulwich Festival Artists' Open House with "more than 200 artists in over 150 locations across Dulwich and surrounding areas are opening their homes and studios" from 11am-6pm, admission free. 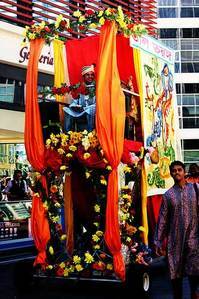 Sunday: The Brick Lane Mela, or Baishaki Mela, celebrates Bengali new year. The big procession starts 11.30am from Buxton Street, E1 through Brick Lane to Weavers Fields. There will be fun and food at Weavers Fields, Allen Gardens and Brick Lane itself from midday till 7pm. It's the biggest celebration outside of Bangladesh, apparently. Admission is free. The Horniman Museum lays on performances and a discussion exploring the heritage of Carnatic (South Indian) and Hindustani (North Indian) vocal music, presented by Pandit Ram Sahai Sangit Vidyalaya (PRSSV). From 12.30-5pm in Gallery Square, admission free. Learn Argentine tango for free at Bow Road Methodist Church, E3 4LY (corner of Bow Road / Merchant St) from 6.30pm. Monday: Secret Chiefs meet to talk about 'The Forbidden Universe – The Occult Origins Of Science And The Search For The Mind of God' at the Devereux, 20 Devereux Court WC2R 3JJ. Talk starts about 8.30pm. Admission is £2. All are welcome. Tuesday: Spend an evening with the journal 'Photography and Culture' courtesy of the Photographers' Gallery with their Writing Photography talk about emerging and contemporary photography in the 1960s. Starts 7pm, tickets £5/3. Takes place at 7 - 9 William Road, London NW1 3ER. Wednesday: Wandsworth Arts Festival runs from 6-22 May so what better time to join Creative Wandsworth and meet like-minded, creative types in the borough. Meet at South Thames College, Wandsworth High Street SW18 between 5-7pm, free to attend. Information and to RSVP (020) 8871 8711. Thursday: Join a celebration of sustainable living at FARM:Shop. Tour the sustainable growing at FARM:Shop, eat wholesome snacks grown on the premises and chill out in the polytunnel. Participate in discussion and debate, listen to spoken word performances and music or grab a bargain in the pop up charity shop. This is a fundraiser so it's £4 in. Go see. At 20 Dalston Lane, Hackney E8 3AZ from 6.30pm. Nigel of Bermondsey heads up his first SELFS meeting by showing you his folklory credentials with an exploration of capital haunting in story and song. Expect phantom riveters, escapees from dream menagerie and malevolent clothing. Find out more at www.selfs.org.uk. Upstairs at the Old Kings Head, Kings Head Yard, 45-49 Borough High Street SE1 from 8pm. £2.50 in. The dailychic offers all of the best daily deals in your city from restaurants to spas, to fashion and much much more. We round up the very best online deals from all the trusted 'group buying' sites including Groupon, KGB (118 118) and Wahanda eliminating the need for you to check tens of sites and subscribe to heaps of emails. We list everything you need all on one site. Vicky Zadeh and Michelle Dewberry are the brains behind this one stop bargains shop. You’ll recognise Michelle as a winner of BBC’s The Apprentice who's a thrifty northerner who can't resist a good bargain! Vicky is an entrepreneurial mum who left a high flying corporate career to co-set up the dailychic to make life's little luxuries affordable to all. So what next? Pop over to the website and check out the latest deals on offer today! Or join our "chiconomistas" on facebook and twitter.